Here’s this week’s dispatch from the crossroads of faith and media. And God made Pluto. Struck Films, Purdie Distribution and Motive Entertainment has announce the upcoming release of The Stray, a family film written and directed by Mitch Davis (The Other Side of Heaven) based on a screenplay by Parker Davis with Ken Brailsford executive producing. Set for release in select markets in the United States on October 6, 2017, the family drama tells the true story of how a stray dog dubbed Pluto impacts a struggling family. The Stray has received the Dove Family Approved seal for its portrayal of positive values and is a film you can take your entire family to see. Multi-award winning artist and songwriter Jeremy Camp’s latest single debuts today. Word Of Life can be found at all digital formats by clicking here. The song is the first single from Camp’s upcoming album slated for release this fall. A true love story. Monsignor Kieran Harrington, host of NET TV’s In the Arena, invited Patti Ann McDonald, Mayor of Malverne, NY and winner of the 2017 Christopher Leadership Award, to speak about her award and life with NYPD Detective Steven McDonald, who died earlier this year. The program–that the Monsignor called the Independence Day show–will air on WOR 710 radio at 8 a.m. on Sunday, July 2, 2017. Mrs. McDonald is a living witness to the Christopher ideal that “It’s better to light one candle than to curse the darkness.”…I do some booking work for ITA and would like to thank Mayor McDonald for agreeing to do the wonderful interview and Jeanne Byington of JM Byington & Associates for getting out the word. More here. 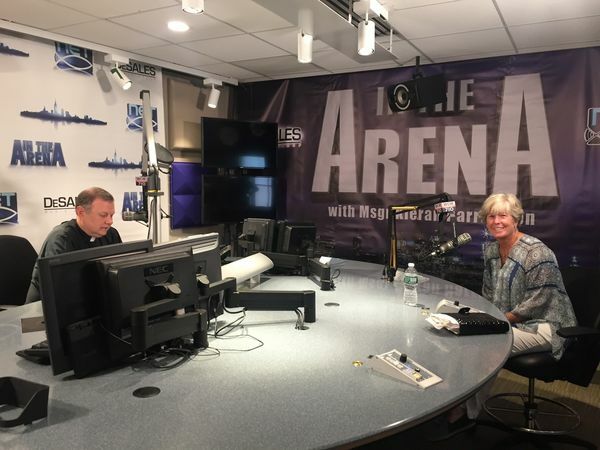 In the Arena, hosted by Diocese of Brooklyn Vicar for Communications, Kieran Harrington airs Sundays in NYC on WOR 710AM at 8 AM (ET), Relevant Radio 1430AM at 1 PM, and NET TV at 8 PM ET and Catholic TV in at 10:30 PM ET! What’s UP with Emmy? Charley Humbard, UP TV’s Founder and CEO, was honored Saturday night with the 2017 southeast Emmy Governors’ Award, a special honor recognizing exceptional achievement. The Board of Governors Awards are for truly outstanding and unique accomplishments or for achievements of some duration and durability. The award can be given to an individual, a company or an organization for outstanding achievement in the arts, sciences or management of television, which is either of a cumulative nature or so extraordinary and universal in nature as to be beyond the realm of the awards presented in the categories of achievement. Speaking of radio: Friend of this blog, Alexis Walkenstein interviews Catholic mystic Frank Kelly this weekend on her Mary’s Touch program. List of radio stations carrying Mary’s Touch here. The Case for Christ hits Blu-ray/DVD market. One of the best-reviewed faith-based films of 2017, is coming to home entertainment on Aug. 15, 2017, from Pure Flix Entertainment. The film will be released into the general consumer market by Universal Pictures Home Entertainment. The film is based on the true story Lee Strobel (who I worked for as a segment producer on his Faith Under Fire PAX-TV series) who in the 1980s was a hard-driving journalist and atheist who decided to use his investigative skills to disprove Christianity. To say the least, the results were not what he anticipated. What’s UP with EMMY? Charley Humbard, UP TV’s Founder and CEO, was honored Saturday night with the 2017 southeast Emmy Governors’ Award, a special honor recognizing exceptional achievement. The Board of Governors Awards are for truly outstanding and unique accomplishments or for achievements of some duration and durability. This award can be given to an individual, a company or an organization for outstanding achievement in the arts, sciences or management of television, which is either of a cumulative nature or so extraordinary and universal in nature as to be beyond the realm of the awards presented in the categories of achievement. UP TV, which began life in 2004 as the Gospel Music Channel before rebranding as UP TV in 2013 , focuses on uplifting programming aimed at families of all shapes, sizes and complexities.” The network has seen tremendous ratings growth this past year as its slogan “We Get Family” resonated with viewers. The network also operates the streaming service UP Faith & Family, available through Amazon Prime, Comcast Xfinity, Dish or upfaithandfamily.com. Prior to founding UP Entertainment, Humbard served as a senior executive at Discovery Networks, responsible for the development and launch of seven digital cable network brands. Additionally, Charley was a founding member of Discovery International Networks charged with launching the Discovery Channel Networks in 140 countries and creating operations facilities on three continents. Son of the country’s first television minister, Humbard began his career writing and recording music and performing on television for the Rex Humbard Worldwide Ministries. 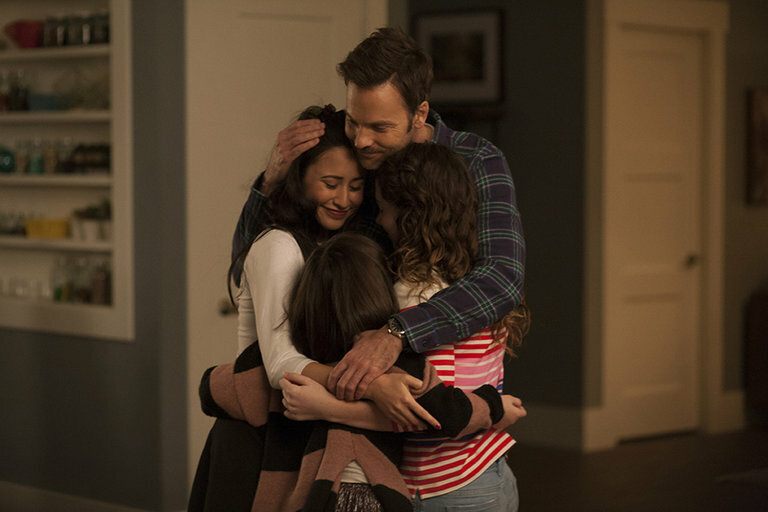 BTW, this weekend being Father’s Day and all, you might want to checkout Date My Dad ((9:00 PM ET), UP’s new scripted dramedy series starring Barry Watson as a widowed father of three daughters and Raquel Welch as has his late wife’s mom and grandmother of the kids. It’s a kindhearted, enjoyable family show that is all too missed on broadcast network television (particularly, since the unfortunate cancellations of ABC’s Last Man Standing despite strong ratings). It seems cable is becoming the place to go for family-friendly scripted fare. (Above photo from Marcel Williams/UP TV). God is calling you forward – no matter how much you messed up. I will heal their waywardness and love them freely. – Hosea 14:4 – This was in my inbox this morning from the National Association of Christian Recovery. John W. Kennedy is a writer and entertainment media consultant.